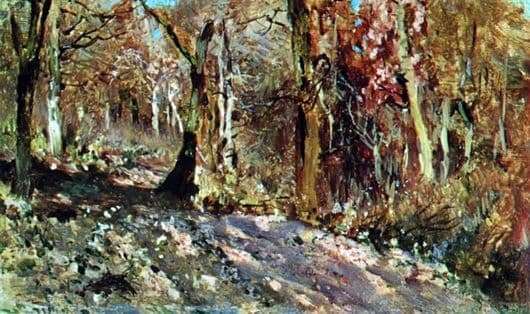 Painting II Levitan “Autumn Forest” was established in 1886. How nice to watch the fall in the forest. Multi-colored outfit on trees and bushes is very in harmony with nature. Peering into the depths of the forest, black and dazzling white tree trunks are clearly visible. This emptiness and at the same time the luxury of color makes one think about a wonderful feeling – lightness of soul. The artist in his early work shows how close nature is to him. The image of the forest supposedly at noon represents the leaves in the autumn sunlight. Unusual silence. Only the rustle of the leaves makes go on the sly, without peering at his feet. The animals have already hidden, and the fallen leaves carefully cover the ground cover. What does the landscape painter think in this work? About high feelings, or recalls a piece of childhood, spent in his native small town. There is an awareness of some kindness and timidity. The presence of two colors of yellow and red color conveys the whole mood of nature on this beautiful day. It may rain, but the foliage is barely moving. Lonely somehow. If you listen, then in the autumn forest, thousands of sounds are trying to break out. They are so easy to perceive that you want to stand for hours and listen to the chirping of birds that have not yet flown away and the roar of tree branches. But winter is coming soon, and the forest seems to be getting ready for bed. Wonderful time here for picking mushrooms, you should look at them a lot. Just red-yellow leaves covered them with his canvas. The painting “Autumn Forest” was painted by the artist in Moscow. Modern landscape sketches were in fashion. An interesting fact is that the landscape was created from memory, and no sketches existed. The forest is so real, the charms of bright red tones are reminiscent of future frosts. Peace of mind is created.